I'm always a bit skeptical when it comes to reading books written from the male main character's point of view--because to be honest, most of the time I find them difficult to read. Happily, this was not the case for Lies Beneath and I definitely ended up enjoying it. Calder's sisters are calling him home to Lake Superior, having found the man they've been tracking for years in an effort to avenge their mother's death; the man in question is Jason Hancock, whose father promised him to Calder's mother many, many years ago. And to get their revenge, they intend to drown him; after all, they're merpeople. But Calder doesn't expect to fall for Lily, Jason Hancock's daughter, and when he does, it'll only make what he has to do that much more difficult. Calder isn't like his sisters--who have always been mermaids--and he's been fighting the urge to kill for quite some time--and, well, he's been avoiding his sisters whenever he can. I can't really say that he feels remorse for killing most of his victims--as the energy the kills give him is important--but that unlike his sisters, he takes no real pleasure in watching his victims suffer. Yes, the merpeople in Lies Beneath are, well, killers and getting your land legs back is a painful process. Then there's Lily Hancock, the girl that Calder falls for; She's an aspiring poet, adores her younger sister, Sophie, and she doesn't fall head over heels for Calder immediately. 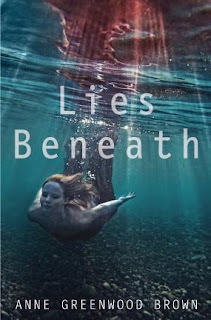 The other thing that I really loved about Lies Beneath was how the mermaids (and mermen) can't stay on land for extremely long lengths of time as it dries them out and that they're sort of driven insane if they don't make a kill. Admittedly Jack Pettit strikes me as a creepy individual and I can tell you that he's interested in the mythology behind the mermaids up near Lake Superior, but I really can't say anymore than that. Let's just say that there's a reason for his interest. Gabrielle I didn't particularly like or dislike as I feel that she wasn't around quite enough to leave an impression on me despite being Lily's friend. As for Calder's sisters? Well, they're definitely not a group of girls that you want to hang around as they will quite possibly kill you--and by "possibly" I mean "really, really likely." Would I recommend Lies Beneath to you? Yes, if you're looking for a tale with darker mermaids (and mermen) and an easy to follow male point of view. The mythology was definitely enjoyable and I really liked how it ended--almost as if it could be a standalone although it is not. In all, an enjoyable read from a perspective that I don't usually read from and I'm looking forward to seeing what happens next! this one sounds so good, and I hope it's the mermaid book I've been searching for. Great review! glad you enjoyed it! More books have been coming out about mermaids lately, and I've been hesitant to read some at the risk of them sounding the same. From your review it sounds like this one might just stand out though. I'll have to give it a try! Lovely review! :D I've heard some mixed things about this one, but I love the concept of these dark, murderous mermaids (plus! male POV! ), so I think I'll give this one a try. I finished this book a couple of days ago and I really liked the dark twist. It was also nice that they couldn't stay on land for a long time. The only thing I had troubles with, was the fact that I couldn't connect to the characters. Lily was lovely, Calder was nice as a male POV, but I never had the idea that I really knew them.